This week we are sharing an old game with a bit of a twist. In fact, you may have played some version of 3 Ball. Our version of 3 Ball involves a Frisbee, but you can feel free to use whatever you have on hand. Before you play 3 Ball, you will need to set up a softball size diamond (baseball is a bit large for the game). If you don’t have a diamond available, use paper plates or flat rubber base pads from the Dollar Store to set up a field. Keep in mind that you will need a large area to play the game. After this is set up, set a canister, or trash can, up where the pitcher’s mound would be. Then separate the teams and put one team on defense and one team on offense. At this point explain to them that the goal is to score as many runs (points) as possible per inning. I usually cap it at 7 runs for the first few innings and make it an unlimited number during the last inning. To score, the individual on offense must kick the kickball, throw the football and then throw the Frisbee. They can do this in any order they wish. At this point, they offensive player must run to second base before the defensive team is able to throw the kickball, football & Frisbee into the canister at the pitcher’s mound. If the defensive team is able to collect everything and put it in the canister before the runner reaches second base, the runner is out. We play no singles, because it’s nearly impossible to collect everything, throw it back to the pitcher’s mound and into the canister before someone reaches first base. A runner can choose to advance further, but they are only safe if they are standing on a base (with the exception of first base) or have crossed home plate. All ties go to the runner. If the first person successfully reaches second base, the next person will be up and will once again throw the football & Frisbee and kick the kickball. In this scenario, if their is a runner on second base, the runner must reach home plate (advance two bases) by the time the defense collects everything and puts it in the canister, if both the “hitter” & “runner” fail to advance two bases, they are both out, resulting in a double play. 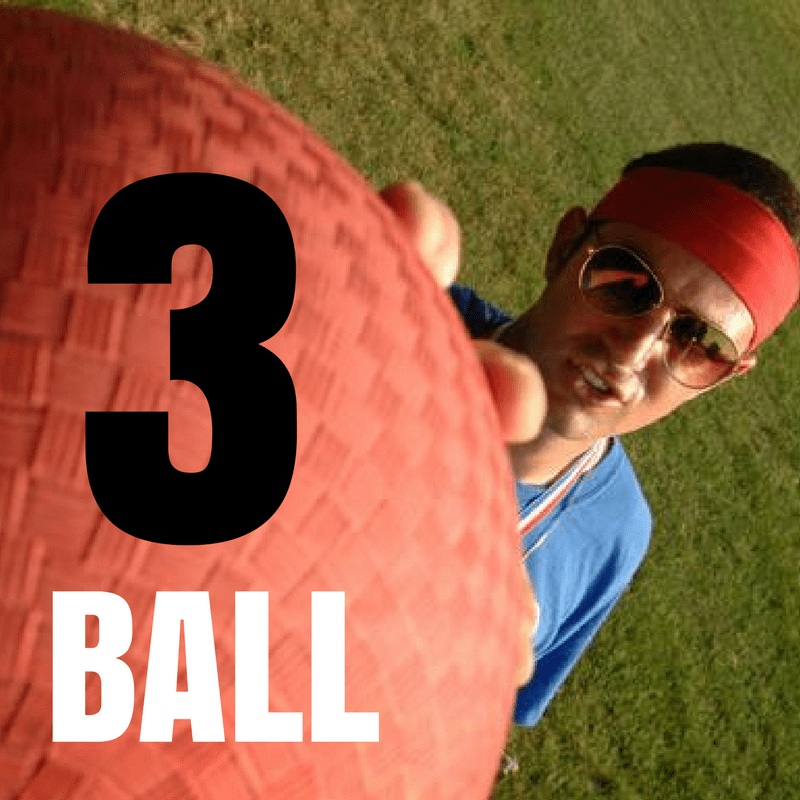 One last rule to remind participants of for 3 Ball: the kickball, football & Frisbee must be in the field of play (between the first and third base lines). If they are not, they are automatic outs, without the need to throw them into the canister. 1. You can use a tennis ball (have them hit with a racket), giant exercise ball or other items as well. Since teams won’t have gloves or may not be too familiar with sports, it’s best not to use baseballs, softballs, golf balls or other dense items that may cause injury. 2. Have teams rotate boy/girl if they are mixed teams. This allows everyone to play and prevents teams from stacking their line up. 3. If possible, have a couple of people to “officiate” the game. Two sets of eyes is better than one. 4. Have a scorekeeper that can remind teams of how many outs they have and the current score of the game. Trust me, if you don’t do this, someone will start debating with you what the score really is! 5. If no one is reaching second base, you can change the rule to allow for singles. Chances are, if you have a lot of people on each team, it will be harder for teams to advance on the base path. 6. Get some fun pics or go live to capture all the fun!